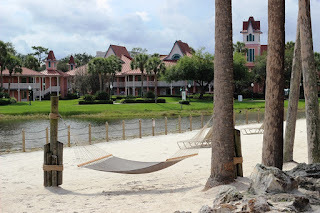 For a majority of our recent trip to Walt Disney World, we stayed at the Caribbean Beach Resort. For those of you who haven’t visited in a while, this resort is under a considerable amount of construction. 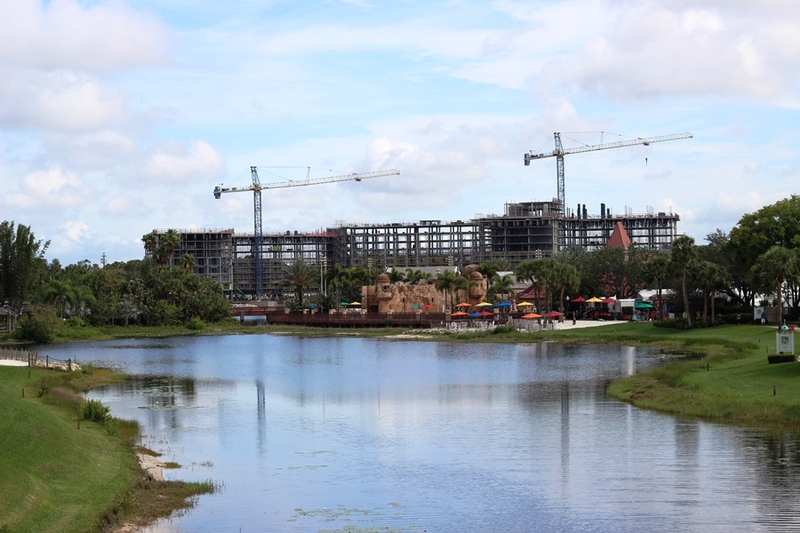 Both the new Disney Vacation Club resort, Riviera Resort, and the Skyliner’s hub are being constructed on opposite ends of the resort. In addition, Old Port Royale is also shuttered as it is refurbished and greatly expanded. All of that is to say that there are sights, sounds, and experiences not typically associated with the resort, but I was curious as to how it would affect a vacation and wanted to be able to report back to you. Let’s start with the bad. Navigating the resort can be a bit of a stressor. Some stretches of the main road are closed making it a bit of a maze to get around. Plus, there are sections that have been carved out of some roads making a large dip that isn’t easy on the rump if you don’t have great shocks. Similarly, pathways between some of the island sections of the resort and Old Port Royale are blocked off with weirdly laid out fences defining walkways through the old parking lot. It took us a couple of days to get our bearings straight and feeling confident enough to make our way around without the assistance of maps or GPS. With Old Port Royale closed, so too are the main dining facilities and shopping features of the resort. There is a truck with merchandise available to peruse near the main pool, as well as a small selection of goods at the reception building, Customs House. It’s a fair selection, but definitely felt like a lot was missing. Prior to last month, the main source of food at Caribbean Beach was a large tent which switched between a buffet and a quick service location depending on the time of day. With the recent opening of Spyglass Grill, the options have definitely increased. While Spyglass Grill may be a bit of a walk, or a couple of stops away on the internal shuttle, it was definitely worth the trek in our opinion, but we’ll have a larger review on that later. Within each island village Caribbean Beach has converted a room into a small grab and go market filled with quick bites, sandwiches, chips, sweets, and the like. They aren’t anything fancy, but they will definitely do the job in a pinch. Also, for those guests with refillable mugs, there are several Coke Freestyle machined scattered about the resort so that guests never have to wander too far to find a cold beverage. Notice that we’ve yet to talk about the construction itself and the distractions it caused. That’s because there weren’t as many as you would think. Yes, roads and walkways were impacted, but that is the most inconvenience that it caused. 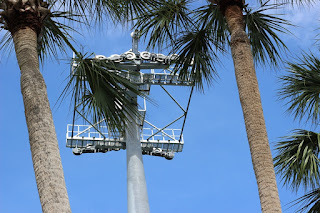 When you were walking around Barefoot Bay, particularly if you crossed the bridges and island of Caribbean Cay, all of your sightlines included some form of construction, whether it was the Riviera, Skyliner hub, or the Skyliner posts, but that seems like a rather minor problem in the scheme of things. The real worry I had was construction noise and I found very little of it unless I was directly on top of the construction sites. Disney is doing a wonderful job of keeping the noise contained to daylight hours when most guests are at the parks, and even then it is not as bad as you would think. We were in the Jamaica section, which I believe is the best section to be in during this period of construction, and even when I was taking naps in the middle of the afternoon (of which there were several), I heard nothing in our room. I didn’t feel the ground shaking from equipment, I didn’t hear crashing or hammering coming for the various sites, inside my room it felt as if nothing were going on. We frequented the pool a couple of times, and while the construction was visible just over the wall, it was almost always drowned out by the lively music and the sounds of children and families splashing in the pool and having a grand old time. 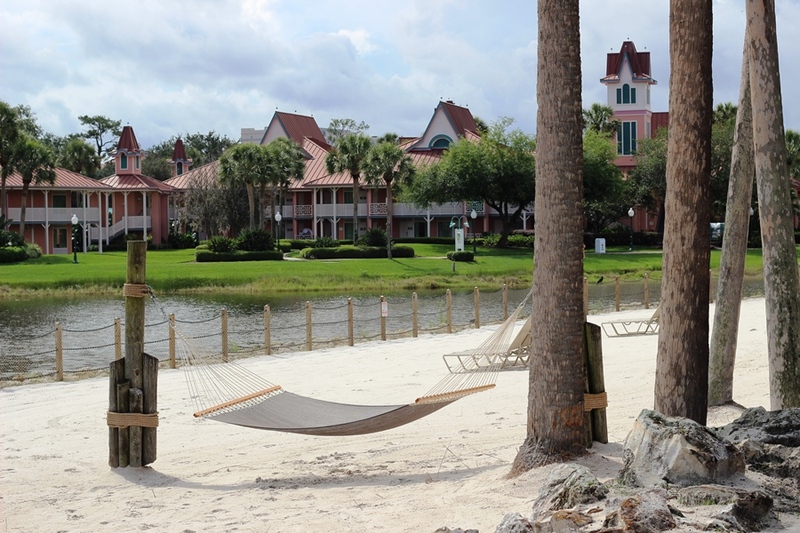 The current state of Caribbean Beach isn’t perfect, and I don’t think anyone would claim that it is. The resort is going through a massive refurbishment that will not only redefine the resort, but the larger landscape of Walt Disney World as well. That said, I was pleasantly surprised by how little our stay was affected by the construction. Caribbean Beach was never my first choice when it comes to moderate resorts, but I was wrong to deride it for so many years. Even amidst all of the turmoil it is experiencing right now, I was able to discover a newfound respect for it and would definitely stay there again. Don’t let the construction scare you away from this resort, it definitely still has charm that is worthy to be explored!